Three-board fencing is the most traditional fencing used for horses. The advantages of three-board fencing is that it is very safe and highly visible. The disadvantages are that it requires a lot of maintenance and tends to be expensive. With research and preparation, you can have a beautiful post-and-board horse fence that will enhance the value of your property. Choose the size and place of the pasture carefully. This will determine the amount of materials needed for the project. The pasture needs to be large enough to accommodate the amount of horses that will be utilizing the pasture, but small enough to fit your budget. It is advisable to separate your pasture into at least two areas, if not more. This is so you can rotate your horses to rest the other pasture areas, and to provide a foul-weather (or winter) paddock to keep them in while saving the rest of your pasture land during this time. Although it may cost a little more up front for extra fencing, it is far better to have several smaller pasture enclosures, than one large one that will eventually get overgrazed and ruined. Lay out a string line from corner to corner. This will help keep the posts straight in between corners. Mark posts every eight feet to show where you will insert the posts. Mark where any gates will be. Horse and people gates only have to be four feet wide. However, most people have gates that are at least eight feet wide. Gates to allow equipment through need to be at least 14 feet wide. Pick a durable wood that is pressure treated for your posts. The pressure treated wood will last longer and need to be replaced less frequently. The posts need to be at least eight feet tall. Five of those feet will be above ground and three of those feet below ground. The five feet above ground keeps the horses from escaping and the three feet below ground is ensure that the posts don't fall over. The posts should be at least four to six inches in diameter. The posts that are used to hold gates should be larger in diameter because they must hold more weight. Rent a post driver or hire a contractor do it. You can also use a post hole digger. However, posts that are driven into the ground are stronger than posts that are put in using a digger. Cementing posts is very expensive and not recommended because it makes replacing the posts extremely difficult. Posts should be put at least two to three feet below the ground to go deep enough below the frost line. Nail the boards to the posts, or use long, heavy-duty wood screws. It is recommended to use boards that are 1-by-6-by-8 inches, but any boards close to this size are acceptable. Place the boards evenly spaced from the ground up to at least 4 feet 6 inches. If you choose to paint or stain the fence it is recommended to wait a few months to let the wood weather first. Install gates in the openings you designed. Steel gates are recommended because they are the cheapest and most durable. You can also add an electric top or bottom wire to keep the horses from leaning on the fence, trying to eat through the fence, or chewing the fence boards. The wire is optional. If you install a "hot wire," you will need a fence charger suitable for the length of your wire, and the number of strands used. The longer the wood will last, usually the more expensive it can be. As far as wooden fencing materials go, untreated pine will not last too long and you may find yourself replacing parts of the fence within a few years. Pressure treated wood will last a good long time, possibly 20 years or more in the right conditions. Cedar and cypress wood will last a very long time, possibly 30 years or more in the right conditions. With the investment you have in your fence, it is extremely important to consider installing one or two "hot wires" on any wooden or PVC horse fence. 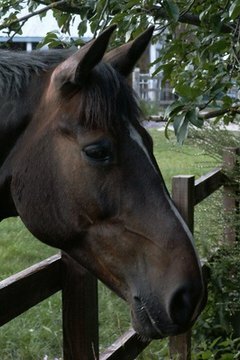 It's primary function is to keep the horses off the fence (from leaning on it, chewing on it, scratching on it, etc.). Doing so will greatly prolong the life of your horse fence. For a very traditional-looking post-and-board horse fence with little maintenance, consider the newer PVC or vinyl fences. They often cost more up front, but you might weigh the time and cost of maintenance over the years, plus the look of the fence as it adds value to your property.